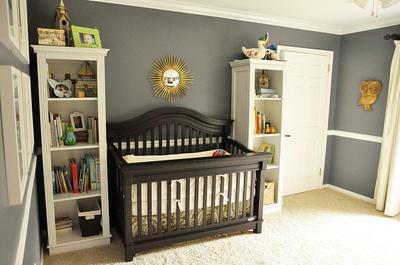 This modern baby boy's navy blue and white nursery was decorated using one of the hottest new nursery decorating trends; silver and gold metallic decorations. Most mommies-to-be are already aware that silver and gold metallic decor is popping up in rooms for babies all over this season but this design is really special. Unlike some "over the top", glam baby girl nurseries; the gold-tone items that define this space won't make your visitors reach for their shades. 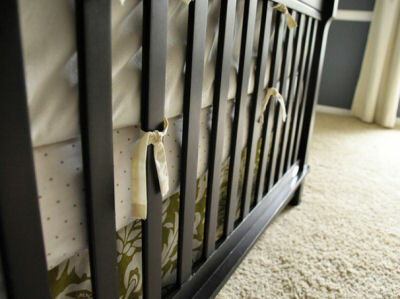 This example is not what one might call a "shiny nursery"; it's very masculine and yes, unique. Go Here to See More . 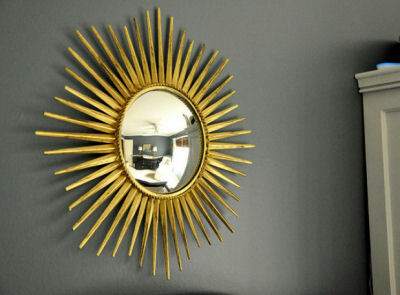 The rich gold patina of this sunburst wall mirror adds light to the dark navy blue wall. A vintage pair of wise old owls owls were purchased two years in advance for use in the nursery. 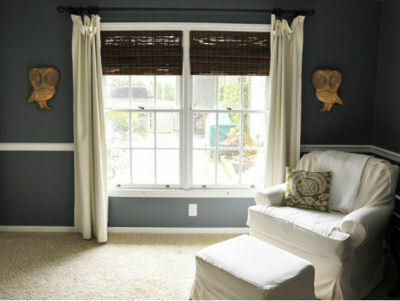 This small portion of the room's design reminds me (a tiny bit) of another baby boy's navy blue owl nursery theme that was featured earlier this year. Lesson learned; when you see something you love..buy it! Sooner or later you will find the perfect home for it! 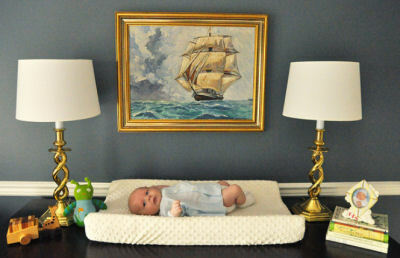 See pictures of more Baby Boy's Navy Blue and White Nursery with Gold Metallic Décor in our photo gallery. The throw pillow in the white, slip-covered nursery glider is made from the same olive green and cream fabric (from Calico Corner) as the crib skirt and the cute polka dots fitted crib sheet came from Target. Speaking of metallic, gold nursery details (or in this case polished brass); this little fellow is surrounded by them! I hope that you have enjoyed Unique Baby Gear Ideas' tour of this baby boy nursery and that you will visit Creative Live Design to read the Tale of Three Nurseries and see more baby nursery pictures. Can someone please recommend a brand of gold metallic spray paint that is baby safe? I have some items that I would like to paint gold to use as wall decorations for my son's nursery and can't find one that I feel will not bring toxic chemicals into his room.